Time for CPS sketch #133. I've kept the sketch as is this week - love landscape format. 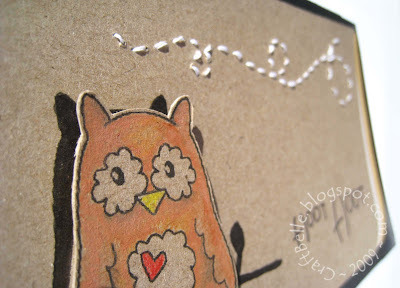 I'm using another digital stamp this week - courtesy of Brooke over at Magnolia Grace. The character's name is Little Owl and in this stamp he sits on a branch. To see more of him, head over to magnoligrace.blogspot.com. Okay, So I printed Little Owl out twice. The back image was coloured black to create a permanent shadow and top image was coloured with watercolour pencils and popped up with foam stickies. To frame the image, I created some abstract clouds/wind with stitching and used a sentiment and the branch to form the lower horizontal element of the sketch. LOVE the shadow, love the stitching! CUTE! This card is so great-I love it!! You did an awesome job coloring Little Owl and adding dimension to him! Thanks for featuring him on your blog! 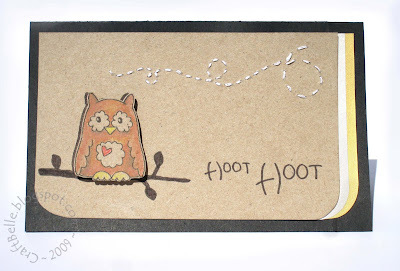 Super fun stiching, owl and sentiment. Way to rock the cps challenge.